The Napa Vintner Stackable Wine Rack is a modular system crafted from premium redwood that gives a custom appearance at a mass produced price. These wine racks may be stacked on top of one another to reach a height starting at 95 1/16", and with multiple molding packages may go as high as 104 5/16", as well as multiple heights in between. Each wine bottle stored on this four column individual bottle wine rack is cradled on customized rails that are carefully manufactured with beveled ends and rounded edges to ensure wine labels will not tear when the bottles are removed. Purchase two to stack on top of each other to maximize the height of your wine storage. Assembly required. The Napa Vintner Stackable Wine Rack is a modular system crafted from premium redwood that gives a custom appearance at a mass produced price. These wine racks may be stacked on top of one another to reach a height starting at 95 1/16", and with multiple molding packages may go as high as 104 5/16", as well as multiple heights in between. The Vintner Series offers a wide variety of racking options, along with the ability to mix and match racking heights and styles. 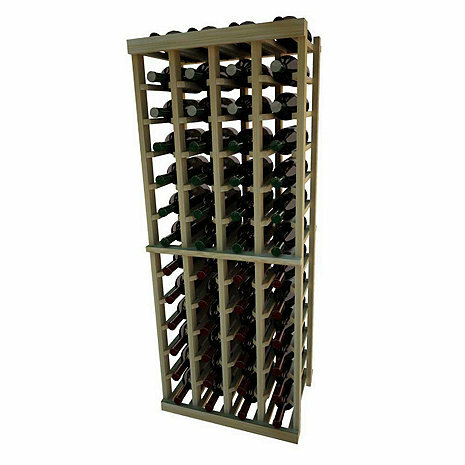 This wine rack collection was designed to accommodate wine bottles that are 3 - 3 1/2" in diameter. In addition to unstained redwood, the Vintner Series is also available in different stain options: classic mahogany, dark walnut, and midnight black. Made in the USA. The Napa Vintner Stackable Wine Rack 4 Column Individual Bottle wine rack stores 52 wine bottles, 100 if stacked one on top of each other. Each bottle is cradled on two rails that are cut with beveled ends and rounded edges which ensure the labels will not tear when the bottles are removed. Purchase two to stack on top of each other to maximize the height of your wine storage. Moldings and platforms sold separately. We'll design your Wine Cellar for $99 (fee is applied to racking purchase). Send us a sketch via e-mail at floorplans@wineenthusiast.com or fax it toll-free to 866.873.2510. Be very careful putting together. Looks nice, and ended up being quite secure, once bolted to wall. A little flimsy during construction, and some of the wood split when being hammered. Ultimately, didn't matter, as it came together well. Very secure in the closet now. Attractive. For the price, great, and gave me the capacity I needed. Very happy. Using the rack in my little wine cellar. Works well.